There’s a Polish proverb, I’m sorry to say, passed down by my mother from her rural past, but excellently pertinent to the modern world, that tells us that Na kazdym slupie, imie glupie. It means something like “On every post, there’s a stupid name”. It refers to the regrettable human urge to mark your presence by — in this case — carving your name into a fence pole or a tree or an old barn door. Kilroy was here, and all that. It’s regrettable not because carving your name into a tree is an act of vandalism, although it is, but because everybody is at it. Everybody wants to be noticed, but, of course, they can’t be. So what has actually been immortalised here is a set of delusions. Which is where the selfie comes in. The desire to create an image of ourselves in which our presence is enlarged by complex imaginings about our worth and our meaning feels like a modern weakness. We live in the age of the selfie. Nobody wants to be a nobody any more. Least of all the nobodies. No arguments there. But although the enactment of this urge in its dumbest modern form, its Instagram form, belongs specifically to our times — hello, Kim! — the urge itself has an ancient past. People have always wanted to carve their name onto a post. In the past, however, only one breed of human was able to achieve this by manipulating and enlarging their own image. Artists. Before Instagram technology came to the aid of us two-a-penny narcissists, the only people who could produce selfies were artists. Facing the World: Self-Portraits from Rembrandt to Ai Weiwei is a busy collection of self-portraits that has somehow crammed itself into the Scottish National Portrait Gallery. What a lot of art. The show has set out to give self-portraiture a history and to separate it into helpful categories. But the intensity of the tumultuous struggles with the self collected here quickly overwhelms the exhibition’s structure. Old is mixed with new, Renaissance masters with contemporary ones, and we skip crazily between the ages as an aesthetic tsunami sweeps order out of its way. The oldest attempt actually dates from about 1510 and features that delicate Venetian master Palma Vecchio, who has taken time off from his usual Renaissance practice of imagining charming scenes from the Bible in order to stare at us over his shoulder and fix us with his gaze. Palma is not usually a psychological presence. He’s an elegant and beautiful painter, not an intense one. But even he becomes another kind of artist when charged with the task of recording himself. The act of drawing a self-portrait plunges Palma into a looking war with his audience. The Palma drawing has been mixed in with a battalion of fiercely staring artists in a category that we might call the existential self-portrait. Its standard bearer is Rembrandt, who produced about 80 such things — paintings, prints, sketches — in which he battles famously with his own ageing process. The Scottish National Gallery is lucky enough to have one of the finest on its walls. Painted circa 1657, when Rembrandt would have been about 50, but looked about 60, it shows him especially careworn, wrinkled, bulbous and tearful. Has anyone ever painted a sadder set of eyes than these? And yet it’s a forgery. A construct. We know from Rembrandt’s other work that wringing intense sadness out of his audience was one of his chief artistic ambitions. He did it in his biblical scenes. He did it in his mythologies. His self-portraiture involves the deliberate pulling of faces. But the faces are pulled to create the illusion of an especially intense truth. Watching all these different artists pulling all these different faces in order to pretend they are all these different things is riveting. The show is particularly rich in what we might call the arrogant self-portrait — those pouty pictures in which lesser figures imagine themselves to be no such thing. Out goes the chest, on goes the wig, and Joseph Vivien from Lyons, of whom I have never previously heard, but who was apparently nicknamed “the van Dyck of pastel” by his adoring 18th- century fans, presents himself at the easel in a pose that looks more suited to court dancing than to court painting. Or how about Scotland’s own David Wilkie, in a self-portrait produced in 1804 when he was only 20, yet already the possessor of a look so cocky and fierce that it belongs on the face of a cavalry officer who has just saved his nation. An uppity Scottish face-painter, at the beginning of his career, is casting himself as a national hero. Facing the World has been organised jointly by three international collections. Alongside portraits from the SNPG are works from the Musée des Beaux Arts in Lyons and the Staatsliche Kunsthalle in Karlsruhe. Many of the painters in the parade are, therefore, unfamiliar — local art stars writ large. Jean-Baptiste Frénet from Lyons takes off his clothes and sits on a rock pointing angrily at the sky. Anselm Feuerbach from Speyer looks up at us aggressively from under his hair, like an eagle who has spotted a mouse. Thus the default expression of the minor artistic talent is a moody, unsmiling intensity of the kind preferred these days by rock stars. All this is as entertaining as it is ludicrous. When it comes to presenting a self-image, minor artists are often able to surpass themselves. And among the old masters, in particular, self-portraiture is a spur for unusual invention. Look what the forgotten Renaissance satirist Vincenzo Campi imagined for us in his wonderful painting of The Ricotta Eaters. 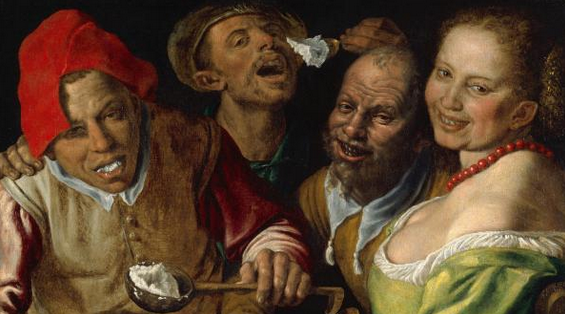 Who knew that guzzling ricotta was this much of a problem in Renaissance Cremona? But there they all are, gorging lustily on big dollops of the stuff, with Campi himself, second from the right, grinning more madly than anyone else. Only when you notice that the ricotta on the table has been scooped into the shape of a skull do you recognise the picture as a warning against indulgence. The other especially fruitful section of the show is the contemporary work. The old masters may have been goaded into unusual inventiveness by the demands of self-portraiture, but they never took to it as naturally as today’s narcissists. The show actually starts with Ai Weiwei’s Instagram feed, flickering with endless variations of himself. But in an age dominated by masculine posturing, it is the women artists of today who seem best able to expand self-portraiture’s range into something pointy and agile. Marina Abramovic combs and recombs her hair while obsessively muttering “Artist must be beautiful” to herself. Sarah Lucas, in ripped and saggy jeans, slumps in a chair with a pair of fried eggs where her breasts should be. It’s an image aimed at the devouring male gaze. Self-portraiture has turned the mirror round and is now pointing it at us.